My husband Nathan and I had such an opportunity for a quick adult dinner recently at El Chile Café y Cantina (3435 Greystone). It’s a short drive over MoPac or a leisurely walk or bike ride across the Far West bridge. We arrived at 5:10 and had to leave by 5:50 in order to be back at Gullett by 6:00 for back-to-school night. We knew we were taking a chance on being late, but the lure of margaritas was worth the risk of being tardy. We chose to sit inside since the late-summer heat was still oppressive, though the restaurant’s outdoor patio looked inviting. There were only two other tables occupied, but over the course of our 40-minute dining experience, the restaurant filled up quickly. 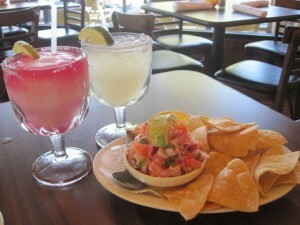 We took advantage of El Chile’s happy hour menu, which includes $1 off drinks and half-price appetizers. I chose the Prickly Pear margarita ($7.50/$1 off at happy hour), which was juicy, slightly sweet, and delicious. Nathan chose a Top Shelf margarita ($8.50/$1 off at happy hour) and enjoyed it, too. Chips and salsa were brought to our table; the chips were crispy and the salsa warmed up just slightly. It’s a very dark salsa, almost the color of bean dip, with a smoky and rich flavor. We explained our “time-crunch” situation to our server, and he was very attentive. Ever the deal-seekers, we ordered off the appetizer menu. We started with the Ceviche de la Casa ($8.95 regular price/half price at happy hour), which contains fresh tilapia marinated in lime juice, along with tomato, red onion, and cilantro. It was served with crispy tostadas. The ceviche was cold, tart, and fresh, with a nice bite to it. We followed that up with a full order of Nachos de Camarón ($10.95 regular price/half price at happy hour), which consists of grilled shrimp on cheese nachos, topped with jalapeños, and served with guacamole and pico de gallo. The jalapenos were a bit much for me, but Nathan enjoyed them. I was a bit skeptical at first, being a bean-and-cheese nacho type of person, but I was pleasantly surprised. While we were eating, the general manager came over to say hello. His name is Todd Youssefi, and he has been with El Chile since the Far West location opened. He clearly takes a lot of pride in his restaurant and the fact that it’s becoming a popular dining destination on the Far West scene. While I did enjoy my appetizer-dinner, he told me that the most popular items on the menu are the Enchiladas de Camarón ($12.95) and the Pescado Entortillado ($12.95). For me, however, the gold standard for any Mexican restaurant is mole sauce. There are dozens of different ways to make mole, and I’m a fan of many of them. I have, however, met a few that I haven’t liked. Our server was quick to accommodate my request for a sample of the El Chile mole, and I was far from disappointed. In fact, it’s one of the best moles I’ve ever tasted, and I look forward to a return visit to try the Enchiladas de Mole Rojo ($11.95). I detected a hint of cloves, and Nathan picked up on a plum flavor. In any case, the mole was a little sweet, a little spicy, and totally delicious. 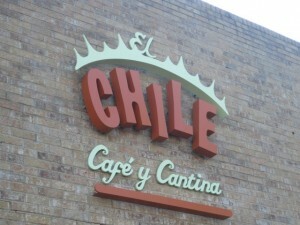 El Chile has been in this current location for two and a half years, and you can find other locations to our east (Manor Road) and south (Barton Springs Road). Although I enjoyed my adult time, El Chile is also a great place to bring kids. Now that the weather is cooler, I see a bike ride across the Far West bridge in my future, with kids and crayons in tow. Mon-Thurs 11 a.m.-2 p.m. & 5 p.m.-9 p.m.